The Cooking Photographer: Sherried Tomato Soup from "The Pioneer Woman Cooks"
Sherried Tomato Soup from "The Pioneer Woman Cooks"
Ree Drummond’s book finally made it to our bookstore! I was so excited I grabbed it and ran to the checkout all the while stuffing my nose in it even as I walked to my car. I stayed up late into the night enjoying every single page. About 2A.M. I had an epiphany. I want to live on a ranch with photogenic cows, and I want to cook every single darn recipe in this book! Seriously. I’ve never had feelings like this before. I have cookbook lust. I have it so badly that I’m even following all her directions. I don’t think this has ever happened to me. I haven’t been taking pictures of everything since this work is hers, but this soup made me stop and grab a shot. You have to try this one. It is better than divine. It makes me not care so much about photogenic cows. Or not quite as much. Ree has me doing things I’ve never done before. Like buying cooking sherry and chicken base. I must not be in my right mind because these are two items I’ve sworn never to purchase! Its lust I tell you. Cookbook, beautiful country food, photogenic cow lust. Plus the book has an all-American wild mustang pageant. I have to admit, Bernadette is awfully pretty, even if Ree is pulling for the super intellectual Ginger. 1. To begin, dice the onion. 2. Melt the butter in a large pot or Dutch oven. 3. Throw in the onion and cook until translucent. 4. Now dump in the diced tomatoes and stir to combine. 5. Add the tomato juice. I used organic juice because I wanted people to think, she’s cool because she uses organics. 7. Next, add 1 or 2 tablespoons chicken base to the pot. I added 3, and it wound up being a little too much. But it’s a middle child thing… I’m always adding more, more, more! 8. Now you can add lots of freshly ground black pepper. Stir to combine, then heat almost to a boil. Then turn off the heat. 9. Now! Here’s the nice little flavor that sets this soup apart. Add in the sherry, if desired. It’ll keep you honest-I promise! 10. And now, people. It’s time to get serious. And it’s time to examine yourselves, and I mean that figuratively, for Pete’s sake: when it comes to heavy cream, are you a man or a mouse? I need an answer now, because we’re about to add 1 ½ cups of the stuff into our soup. And mmm… stir it together. 11. Now chop up a handful of flat-leaf parsley. And really, I’m not opposed to that curly parsley. And actually, blind taste tests have shown that there’s really not much difference in taste. But flat-leaf is a little more texturally palatable, so if you can find it, it’s best. “Texturally palatable.” You know, I just throw these phrases out into the atmosphere and I have no idea where they come from. Or where they are going. Or where they have been. 13. Now go ahead and throw in the parsley and the basil, and stir together. Next, take a whiff of this heavenly delight. Then faint. Then pick yourself up off the ground and grab your pepper mill again. 14. I always set it to fine for this soup, and I really let ‘er loose. I love freshly ground black pepper. 15. 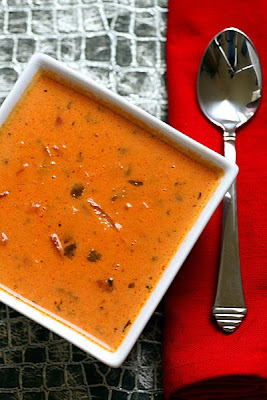 Keep the soup warm and serve it on a cold day to people you love. The flavor will knock your socks off. Recipe from Ree Drummond's book, "The Pioneer Woman Cooks, Recipes from an Accidental Country Girl". Visit her award winning blog. Picture by the unworthy Laura Flowers who now wants to live on a ranch with photogenic cows someplace where it doesn’t snow. That photo is awesome! Wow! That soup looks full of flavor. I am about to leave an award for you, Laura. Thanks for always stopping by my blog. Your photo is amazing. I'm loving this book as well, the soup is on my list to make ASAP. That is one great looking soup! I only discovered The Pioneer Woman yesterday while out surfing, and I spent ages looking at cows - not a subject I would have ordinarily though fascinating!) Love reading about what you thought of the book. I've been craving tomato soup, you must have heard me!! Gimme a grilled cheese and Im a happy camper.. Looks fanatastic! I am a huge PW fan as well. What a great photo. I really enjoyed her ramblings. Whoa baby! I really like the photo you took of this one. I love her cookbook too. Have you tried her chocolate sheet cake?! OMG!!! I ate the whole thing by myself. No wonder my pants won't fit me. Hi Laura, I just want to eat this picture right now. The cupcakes from your last post were adorable, did you made the roses? I might need your help when I open my cake studio, but I guess you will be in your own cookbook tour and you won't have time to help me. You are so talented! That picture is so pretty! I didn't get a chance to check out her cookbook yet, but it seems like everyone is enjoying it! AMazing photo. I heard good things about the book too. Oh wow, this does look amazing! And you pic is perfect, as usual :) Thanks for all your sweet comments on our blog! Oh I bet all that butter in this tomato soup makes it divine!! isn't it fun to be so excited about a cookbook!! Beautiful photo and the soup looks scrumptious! I need to take a peek at her cookbook next time i'm at the bookstore. Your photo is beautiful! This looks like a terrific, flavorful and hearty soup. Yum! I don't often find myself laughing out loud when reading food blogs, but this one was great! I'm ready to try this one. Seriously ready. And trust me, after you've photographed your photogenic cows, you'll want a bowl or 6 of this soup! Thanks for the comments. I chuckled through many of them! And Amber I'll remember always to bake that sheet cake around 40 other people lol. I love cakes like that, I would have inhaled the whole pan. What a gorgeous soup and now I can see what all the noise over this book is all about! Looks fabulous. Very, very nice! The photo, Ree Drummonds cookbook, the fabulous soup recipe, everything! Does this mean that you are going to take on a project of cooking every one of Ree's recipes from her new cookbook? I love cookbooks and pre-ordered this through Amazon before its release. Yep, it's great! Her commentary is funny(just like her blog)...it's as though she's talking to her next door neighbor:) I hate to admit it, but I haven't tried anything from it yet, but now you've inspired me to do just that! I love Ree, too. I hope you will visit my new food blog, where we'll post her recipes twice a month...well, I'll round-up recipes from PW that bloggers have made. This soup looks like one I'd love to make. ...and I missed this one too???? Okay, this book is going to be #1 on my Christmas List. Can't wait to get my hands on it. I've been following Ree's blog for a long time... love it! PS - Picture by the unworthy Laura Flowers who now wants to live on a ranch with photogenic cows someplace where it doesn’t snow. HA!!! No you may not quote my post in your blog, you are not allowed to quote any post I do ever. Do your own work, do NOT steal mine.